If you are currently residing in the Southern Hemisphere, you are probably longing for a tropical escape to a secluded island, practising yoga every morning to recharge, buffet breakfast then follow by a Pina Colada in one hand and a book in another. I am not the only one, am I? That being said, today's #TravelTuesday will be featuring Four Seasons Resort Bali's anti gravity yoga in it's New Dharma Shanti Yoga Bale. Four Seasons Resort Bali in Sayan has launched a dynamic and groundbreaking Anti-Gravity Yoga program for the launch of its new Dharma Shanti Yoga Bale. 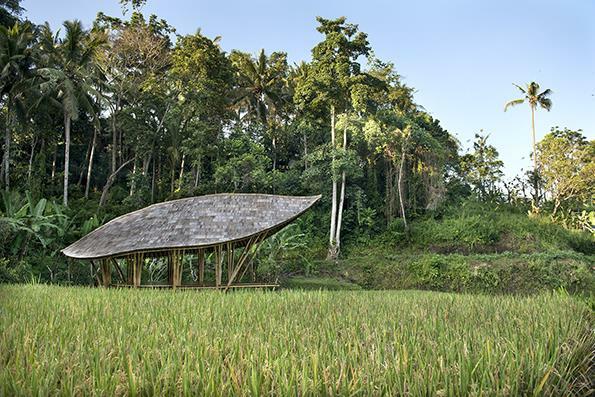 Nestled alongside the sacred Ayung River, the Dharma Shanti Yoga Bale is fairy tale-like, aerial-inspired structure constructed entirely from locally sourced bamboo that is grown throughout the river valleys and mountainsides of Indonesia. The Anti-Gravity Yoga Program is a one-of-a-kind health and wellness experience that utilizes bespoke hammocks to create a support system allowing for greatly expanded levels of movement and flexibility. While I know how being upside down can be fun (in my semi decent headstand! ), getting upside down on the bespoke hammocks seems pretty next level to me! Each session goes for 60 minutes involving a full range of lengthening and strengthening poses that encourages swinging, twisting and stretching. The main component (and probably the most exciting part in my opinion!) about anti-gravity yoga - the flying sensation is supported through the use of hammocks as flexible support slings. The hammocks allow participants to experience zero-compression inverted posture, from playful handstands and the thrill of hanging upside-down through to the absolute peace inspired by the cocoon-like feeling of simply swaying in savasana,(corpse pose) surrounded by the tranquil beauty of the resort! For more information, head over to Four Season Bali's page to find out more.